With over 30 years as a successful roofing contractor, you can count on Steve Daddario and the Daddario Roofing team. We are proud to be a DIAMOND CERTIFIED COMPANY, as well as a member in good standing with the Better Business Bureau. 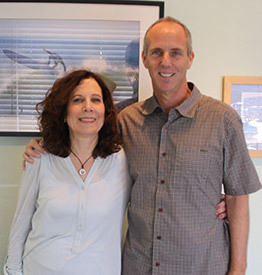 Steve and Dawn Daddario started their Roofing Company in 1982. Our company grew in size over time, and our reputation for Quality, Integrity and Courtesy fueled that growth. We won a number of industry awards, including RSI magazine’s “Certificate of Merit” award (RSI is a national roofing trade publication), Mass Mutual’s “Excellence in Small Business Award,” and we also were West Magazine’s “Bests” top vote getter for best roofing contractor in Santa Clara County by a wide margin. While we gained experience in becoming one of the largest and most respected roofing contractors in the Bay Area, we decided to downsize our company and pursue our dream of moving back to Santa Cruz County, where we began our married life. We now enjoy the benefits of having run one of the largest residential roofing companies in the Bay Area, in a smaller, more personalized version. THIS MEANS AN ABILITY TO GIVE THE BEST CUSTOMER SERVICE POSSIBLE! 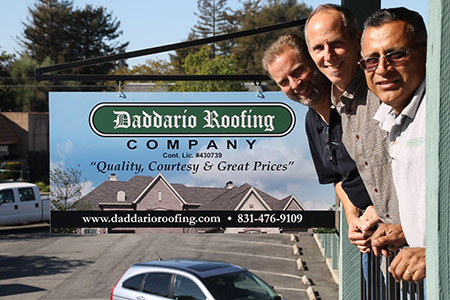 Steve Daddario, Edgar Montoya, who has worked with Daddario Roofing team for over 25 years, and Joe McNair, senior estimator and inspector, perform all the estimating and roof inspections themselves. We are able to be “hands on” in all aspects of the production management of the jobs, from meeting with the inspectors, to personally making sure our clients are pleased with their new roof. We have continued to earn industry awards for excellence, including being named an “ANGIE’S LIST SUPER SERVICE CONTRACTORS” every year since 2010. Every client we installed a new roof for gave us an “A” rating, along with glowing reports for the job we did. We are also proud to be a Certainteed “Select Shingle Roofer”, which means we passed extensive testing by the manufacturer. You will also receive the benefit of better pricing, based on our lower overhead. In short, with our proven track record of quality and service at a better price than the larger contractors, your best choice IS Daddario Roofing Company.